Buy Local. Our 2012 calendar featuring old photos of Montgomery will be available soon. Pratt Hall Cards also make wonderful gifts. Both are super for the holidays. 1. What was the total of the first Federal budget? 2. Prior to the implementation of the Income Tax, tariffs were the principal source of Federal revenue. What percentage of Federal revenue did tariffs make up make up prior to 1860? 3. What was the average annual “tax” per person in 1790? This year marks the 150th anniversary of the start of the Civil War and communities throughout the State are commemorating numerous events from that era. A new historic marker honoring the men of the 5th Vermont Volunteer Infantry Regiment and Camp Holbrook where many Montgomery men were "mustered in", was dedicated in St. Albans in late September. It is located on Route 7 just north of the Route 105 intersection near what is now the Vermont Federal Credit Union. The St. Albans Messenger has a nice article about the 5th VT and the Camp Holbrook marker. Here in Montgomery we did a special Memorial Day program which included the remarks, abbreviated, below. The full version is posted on our web site. 150 years ago this December Montgomery's first Civil War casualty was recorded. He was a member of the 5th VT.
"In July of 1861 President Lincoln made a second call for the States to supply the Union Army with men and Vermont would respond by forming the 2nd through 6th Regiments of Vermont Volunteers which included 27 Montgomery men. Charles Haile, a farm boy from the Center, enlisted on September 4th. He would eventually travel to St. Albans mustering into the 5th Regiment of Vermont Volunteers, an infantry unit, with 11 fellow Montgomerians on September 16th. He would turn 19 there. His unit received orders to move to Washington and they departed St. Albans on September 23rd. There were just over 1,000 men and they filled two trains. They traveled to New Haven and transferred to a steamer ship which operated in Long Island Sound and took them to Jersey City where they then boarded trains again for the final leg to Washington They arrived on the 25th and spent the night in a large and empty building used as transient quarters. Charles Haile’s regiment was particularly unlucky in this regard. On the 10th of November, the morning report showed 250 men… excused from duty on account of sickness, seventy of them being in hospital with typhoid and other fevers, and measles. Several deaths occurred. The hospital tents were overcrowded with patients, and the sicker men were removed to a deserted mansion, two miles from camp. While many men's health improved, Charles Haile would not be so lucky. He died just three months after arriving in Washington on Christmas from an unspecified disease. He hadn't seen battle and wouldn't see his 20th birthday. Charles Haile was the first soldier from Montgomery to die in the Civil War. Montgomery's population at the start of the Civil War was 1,260, about the same as it is today. According to the “Vermont Civil War” organization there were 160 individuals born in, credited to, or buried in Montgomery that served in the Civil War. Of them, the youngest was 14, and the oldest 2 were 45. The average age was 25, while the median was just 22. " 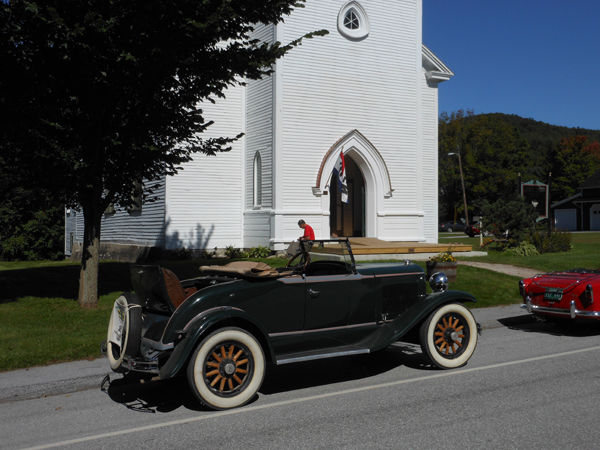 A group of about 20 antique car enthusiasts visited Pratt Hall for tea and cookies mid day on September 10th. We gave them a tour of the Hall and answered their questions before they departed on the next leg of their journey. Our thanks to them for stopping by and making a donation to our tower project. The final concert in this year's "Concerts by the Common" series drew a crowd of over 100 to Pratt Hall on September 10th. The band was part of the series 22 years ago and had fond memories of playing in Montgomery. The consensus was that we all looked younger and smarter than times gone by. BD&MP played a concert to benefit Hurricane Irene victims earlier in the day and we took up a collection in the same spirit. 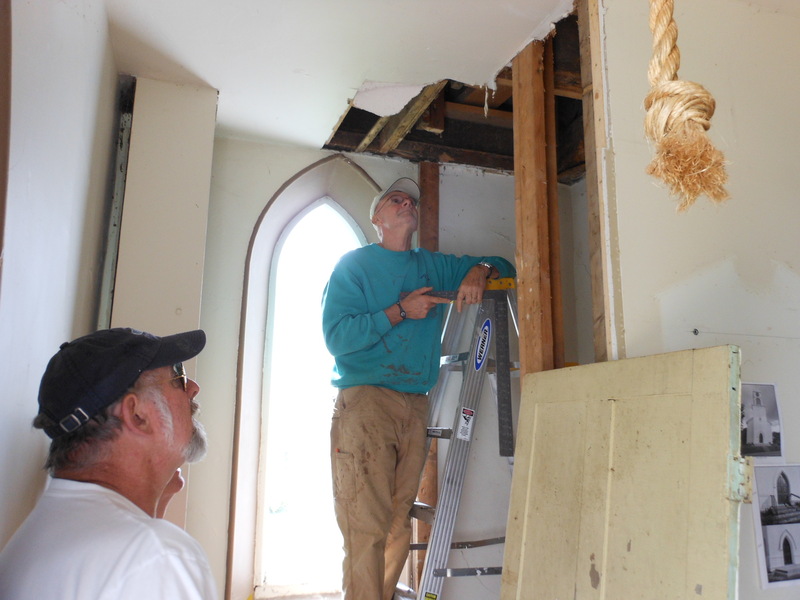 Our audience donated $200 and the MHS Board decided to give it to the Preservation Trust of VT to support their grants for evaluating the damage to historic buildings. Thank you to our audience and members. A special thanks to all of our sponsors and patrons whose financial generosity make these shows possible. Extra special applause to the Eastman Charitable Trust, and to Steve Hays, for another wonderful series, our 23rd. It wouldn't happen without them. 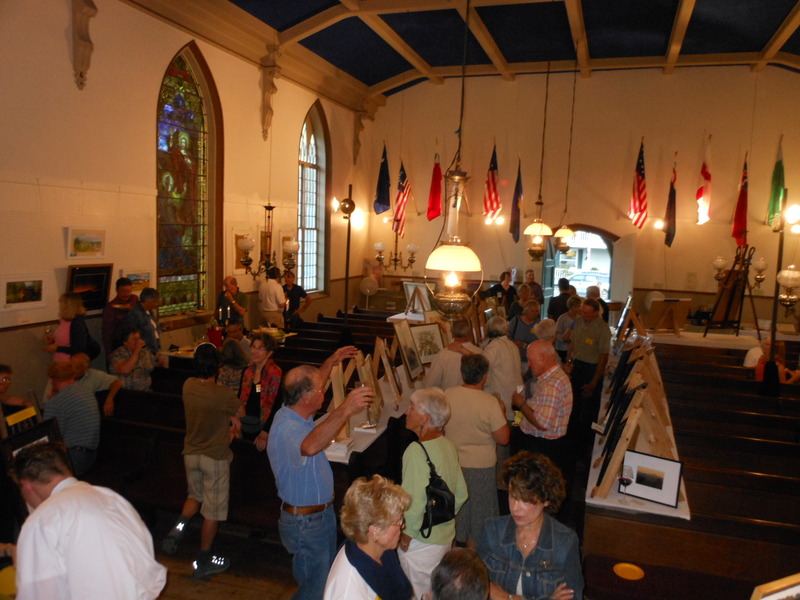 The yearly Art Show and Sale & Membership Appreciation Reception returned this year and was well attended. Attendees enjoyed complimentary wine and cheeses while chatting with the artists and enjoying their work. 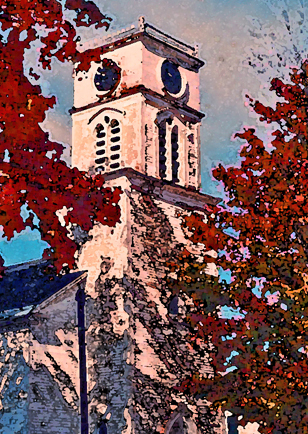 Peg Doheny won the raffle prize, a limited edition print of Pratt Hall by Michael Domina. Thanks to our creative artists and MFWIC (Most Fabulous Woman In Charge) Noela McGroarty for pulling everything together. There once were some men who had tools. 'Twas certain they're nobody's fool. of Montgomery's historic crown jewel. The Dr. John Tortalano presentation on the Canadian Group of 7 landscape painters scheduled for 19th. November has been cancelled. We hope to reschedule for next Spring. Our Membership Holiday Party will be Dec 16th. We also plan to reprise our Open House (Dec 17th), and Carols and Candles (Dec 18th), and are working on a presentation on Ethan Allen this Spring. Stay tuned for times and other details. Click Here for the latest info on this year's MHS Events. Hurricane Irene left Pratt Hall unscathed. While erosion, flooding, and wind damage in Montgomery was among the worst in Franklin County, the more southern part of the State had much more serious damages. Jon Zachadnyk, or Zack as he was known by most, passed away earlier this month. Pratt Hall will host a celebration of his life on Oct. 29th at 4:00p.m. Bring an hors d'oeuvre to share. BYOB. It was amazing how many people you would run into all over the world who knew of Montgomery from his restaurant on the Hazen's Notch Road. Zack was a generous supporter of the community and the Society. God bless him and his family. This year's LLHS Annual Meeting will be at the Statehouse in Montpelier on Nov. 4th. The keynote speaker will be Willem Lange (of VPR fame). Please give us a call if you're interested in attending, or visit the Vermont Historical Society web site. Attendees must register by October 24th. We nominated our Pratt Hall entryway/tower restoration project for a Historic Preservation Award this year. If approved this will be our 8th award since 2007. Keep your fingers crossed. Late Breaking News... We won! The LLHS award Committee said "The scope of the project, and commitment to the careful quality workmanship despite the hurdles encountered is inspiring. It is evident that your local society realizes and greatly appreciates the treasures within their community." We also wish to acknowledge our Women with Tools (W2T) who have cleaned the hall after each mess, kept plants alive, and the gardens prospering. We are blessed to have such a happy and dedicated group of volunteers willing to pitch in at every turn. The 1917 photo, left, shows Pratt Hall's likely circa 1874 appearance. Photo right, is Pratt Hall after 2011 restoration activities. Note new steps and the door hood molding. 2. d. 80%. Tariffs generally averaged between 80 and 95% of all Federal revenues until the Civil War. Other revenues included Excise Taxes and Special Levies. 3. a. $1.00. Based on a population of about 4 million earning .25/day would take four days to earn enough to cover the “tax”. 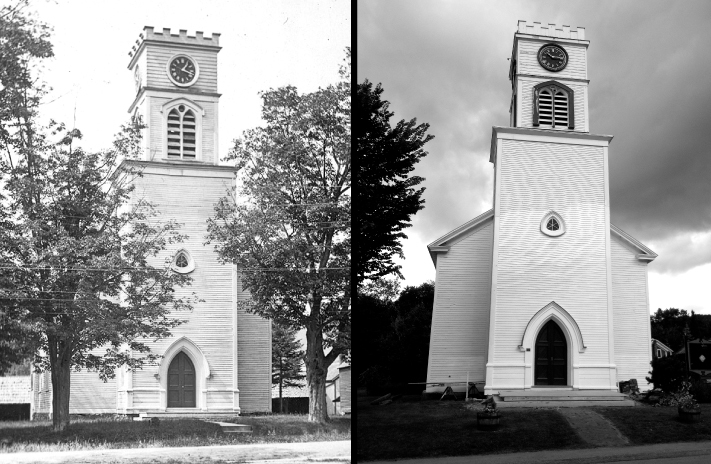 In October 1789, Montgomery's Charter was approved by the Vermont legislature. In November 1922, Grace Brooks was ordained a baptist minister in Montgomery. She would go on to be the first woman pastor in the State. In December 1738, Gen. Richard Montgomery was born in Dublin Ireland. The Messenger is offering a new service which allows you to search their archives on line. It includes many of their back issues from 1860 to 2006 and they are filling the gaps every day. Other State papers are offering similar services. A search on the keyword "Montgomery" resulted in over 46,000 hits. Sure beats going through the microfiche in the library. There are daily and monthly subscriptions to the archive service. Click here for more info.